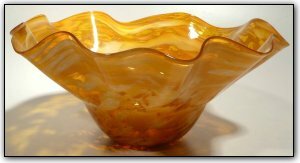 This fluted bowl features many shades of deep and rich gold topaz. The colors are absolutely gorgeous and incredibly vivid and rich, nearly jumping out of the glass itself. This bowl can also be displayed on its side to showcase the interior. Make sure to zoom in and see the intricate, almost three-dimensional effect as the colors interact with each other... such an amazing bowl!